DownWithTyranny! : Midnight Meme Of The Day! I thought Republicans were all for the death penalty for things like kidnapping. As of this writing, hundreds of children are still "separated from their parent." How's that for a euphemism for kidnapping? Court-ordered deadlines have come and court-orderd deadlines have gone. Our burgeoning totalitarian government has even stated that they simply will not be returning at least 600 children. This has become a twisted and very Trumpian (read Republican) example of that old possession is 9/10ths of the law thing. Since the beginning of Trump's "Steal The Children Initiative," I have wondered about the profit-making aspects of his endeavor. Republicans have long supported privatizing prisons for profit. One need only look at Arizona Governor Jan Brewer's infamous prison privatization scam. Let's face it, privatized prisons need occupants in order turn a profit, and the various crises south of the border amount to a perfect storm for profiteering. If you don't believe or care that that's driving current immigration law you're probably naive, hateful, and/or dumb enough to be a Trump supporter. It's the same deal as, say, hiring your friends to restore power to Puerto Rico after Hurricane Maria. How'd that work out? Say heckuvajob three times. Over the next many months and years, we will, if there is still any manner of press freedom left, be hearing about all sorts of Trumpist profiteering off of the traumatization of children, not to mention the future dark manifestations of the anger of those children. They weren't MS-13 coming in but some of them might be soon, thanks to the reverse genius of Señor Trumpanzee. Not to worry, Trump and his kind will find a way to make a profit from that, too. "Only I can fix it!" Christian organizations can be a slightly different animal but they can also be every bit as suspect. Over recent years, the DeVos family has given over $1,000,000 in grants to Bethany Christian Services. To be fair, Bethany Christian Services is actually registered as a non-profit, but, $700 a night will get you a great hotel room here in New York City, so, really? $700 per night? What other "charges" are there? Maybe $20 for a baloney sandwich? Slice of process cheese $5.00 extra? That and the fact that there is a connection to DeVos and Trump gives the whole thing a really foul smell. You are who you hang out with. Lay down with dogs...It doesn't help that the Christianity that Bethany espouses is of the conservative, homophobic nutjob variety, ie. the kind that republicans embrace and the kind that is rife with profiteering mega-church pastors who flaunt their wealth with things like private planes and absurdly large mansions, all in the name of Jesus, of course. Also, how Christian is it to offer children for adoption when they already have parents? Hence the terms 'kidnapping' and 'trafficking'. So, maybe Betsy DeVos is or is not directly profiting personally here, but, it's only natural, given what we do know about DeVos and the kind of characters in Trump's orbit that we assume cash is being somehow pocketed in places where it doesn't belong. Given all that, we can't help but think that Trump, his grifter Beavis and Butthead family members, and any number of other key republicans from Mitch McConnell and Paul Ryan on down will be reaping personal profits, and not just electoral support, from things like cages, locks, and diapers. It's a safe guess that even some of the security guards who keep any politicians or members of the press from finding missing babies are involved in a lot of for fun and profit scams, and worse, related to this horror. 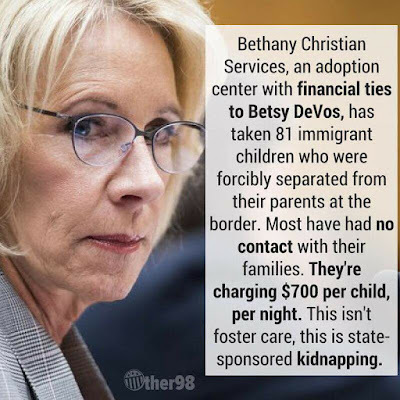 Keep in mind that it is DeVos's brother who founded Blackwater, so it wouldn't be much of a stretch to think that his sister's brain works in similar conniving, profiteering ways of profiting from human misery and cruelty. Family Values, Republican style. In the end, portions of our tax dollars are going to always end up not really helping children but going to accounts on offshore islands. It is the way of grifters. Someone needs to follow the money, and then (ha-ha) actually do something about it. No surprise. There are infinite examples you could cite of "Christian" service orgs that exist for someone's financial benefit, to fleece someone/something and foment hate of some kind. A sane society would be working very hard right now to prosecute thousands for this kidnapping regime. Everyone who works for ICE and has interacted with either the parents or kids should be stood up in front of a firing squad. Everyone up the chain who ordered their actions should be publicly tried ala Nuremburg and face the same fate as the Nazis. Our Spandau could be G'itmo. Is this just the first step in re-establishing slavery in the US of A?